Now that you have installed JungleDocs for Office 365 you will need to add the app to the SharePoint site you will be using it from. In this quick tutorial, you will learn how to add the app to your SharePoint site. Open your SharePoint Online portal and navigate to the site where you want to enable JungleDocs 365 app. 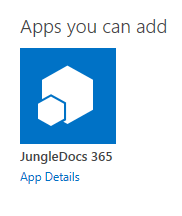 Find JungleDocs under Apps you can add and click on it. Now JungleDocs 365 app is added and visible in Site Contents. It will also be available from the document libraries ribbon.